I wanted to suggest something I’m doing for pew bows / pew markers. I balk at being just like every other wedding… and so, no just plain tulle bows for us! I went to Wal-Mart and bought loads of silk ivory rose candle wreaths (3 different sizes). I have made beautiful ribbon bows that go on the middle of the wreaths. On each bow is glued a beautiful small bird. The larger wreaths are hung from the first 5 pews for family, the medium sized bows are on the next 3 pews and the smaller wreaths finish the church. It costs much less than fresh flowers, and certainly much less than hiring a florist or wedding decorator to achieve this same effect. 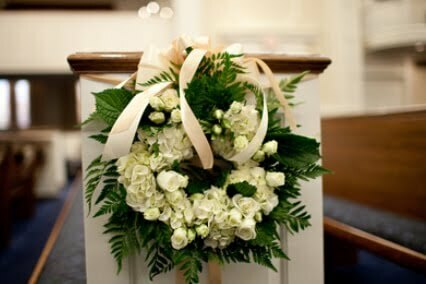 I live in Canada and my wedding is in March which means there won’t be many fresh AFFORDABLE flowers in season. This way, I get flowers in the church at an affordable cost. I have also taken some of the silk petals, snips of the ribbon, and fairy lights, all rolled together into a long piece of tulle to line both sides of the aisle I will walk down. I’m getting married at 6pm so fairy lights will be a beautiful touch. Oh, and one last thing, I also bought the same silk flower wreaths to use as centerpieces on the tables with candles placed in the center for the reception. Hope this helps someone! And congratulations on your wedding, too! ~ Pauline Stevens, Quebec City, Canada.